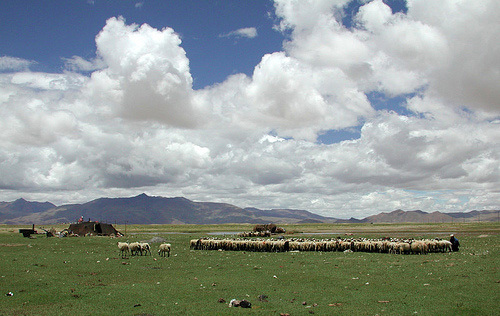 Tibet Overland Tour is provided an opportunity to explore Tibet, the roof the world. In different city of Tibet, you'll have chance to explore Buddhist Monasteries and Tibetan life. Lhasa is end destination of this trek. Tibet tour guide through dry land of Tibet, where you have can observe Tibetan Monks and their life. On this trip, we will travel in Land cruisers 4WD, following the Mount Para Adventure & Expedition through some of the most amazing landscape on Earth and staying in the best traditional hotels Tibet has to offer. We'll pass small Tibetan settlements, nomadic herdsmen wandering across the wide arid plains and awe-inspiring mountain peaks. Equally as fascinating is the wealth of cultural interest and we will have plenty of opportunity to explore this side of Tibet, both in Lhasa and the other towns we pass through on our journey.Tibet Overland Tour is provided an opportunity to explore Tibet, the roof the world. In different city of Tibet, you'll have chance to explore Buddhist Monasteries and Tibetan life. Lhasa is end destination of this trek. Tibet tour guide through dry land of Tibet, where you have can observe Tibetan Monks and their life. On this trip, we will travel in Land cruisers 4WD, following the Mount Para Adventure & Expedition through some of the most amazing landscape on Earth and staying in the best traditional hotels Tibet has to offer. We'll pass small Tibetan settlements, nomadic herdsmen wandering across the wide arid plains and awe-inspiring mountain peaks. Equally as fascinating is the wealth of cultural interest and we will have plenty of opportunity to explore this side of Tibet, both in Lhasa and the other towns we pass through on our journey.